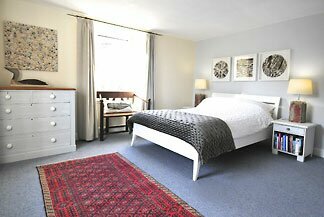 For our B&B guests we have a cosy sitting room with a sea view out to the Hebrides. 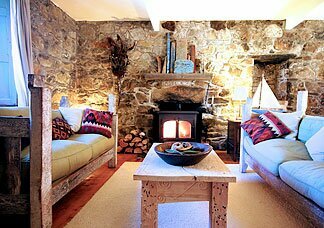 For our B&B guests we have a cosy sitting room with a sea view out to the Hebrides, a log burning stove and T.V. 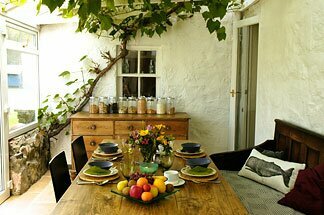 This is next to the breakfast room/conservatory with a leafy vine that fills the roof space and by the late summer bunches of black grapes hang above your head. Views from the large windows are across to the walled garden and the hill beyond, great for watching raptors during breakfast. Our two double bedrooms have en-suite wash basins and showers. 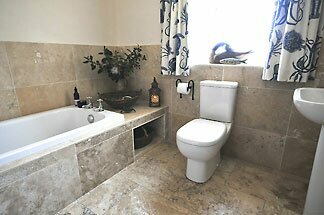 The bathroom has a iron bath with wash basin and toilet. There are stunning open views from all windows. Tea making facilities with delicious local bakery biscuits are provided. A Z-Bed(suitable for a 3 to 12year old) or a cot can easily be put into a room. Our breakfasts are fresh and home grown. We have a selection of Museli's, cereals, fresh fruit and yoghurt. Homemade jam and marmalade with Aga toast. Helen's stewed Rhubarb is a favourite. Fresh bright yellow eggs from our free range hens served with bacon and tomatoes. Good Italian coffee completes the breakfast. 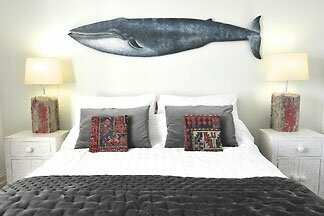 We try to make your stay as comfortable as possible. We have a small kitchen with a microwave and sink downstairs that guests can use to make a simple evening meal. This is a especially useful for cyclists who don't want to ride the extra miles for a bite to eat. We can dry boots and coats ready for the next day if necessary.